Located in Southeast Asia, go on a tour package to Malaysia is to enter in one of the most multicultural and colorful countries on the continent. It is made up of different Hindu, Chinese, Malay and indigenous communities that have settled in the peninsula, raising their particular neighborhoods in some of the main cities. The beauty of Malaysia's beaches and its unspoiled nature can be found in the islands of Langkawi, or in its many national parks such as Taman Negara, in the north of the peninsula; and Baku, in Borneo. Characterized as one of the best regions in the world for diving, its capital Kuching is the most populated city in the area. From here many excursions depart to go into the jungle or to enjoy the cliffs of its coast. 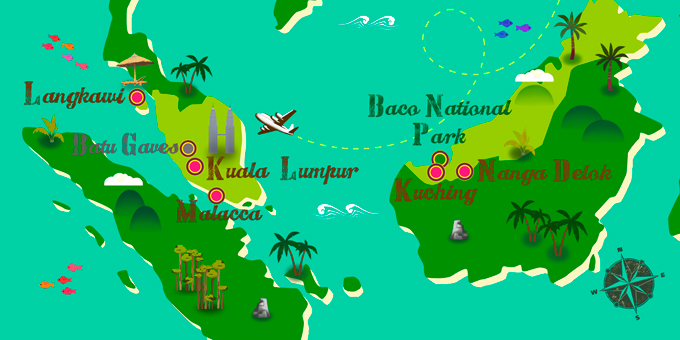 A journey to Kuching cannot be missed on a vacation package to Malaysia.